What is a Back Piece? I started making “back pieces” as custom requests many, many years ago as hair styles began trending toward low buns or chignons. Now back pieces are a regular part of each season’s designs and by far one of the most popular ways to accent the hair. I‘m not exactly sure how the term back piece emerged but it raises a lot of questions from brides about what it is and how to wear it. This is the first of a few posts about the different types of head pieces. So here we go! Some pieces such as the Beautiful Girl Back Piece and the Grape Flora Hair Ornament can be worn along side a french twist or tucked into the gathered section of hair that is half up/half down. 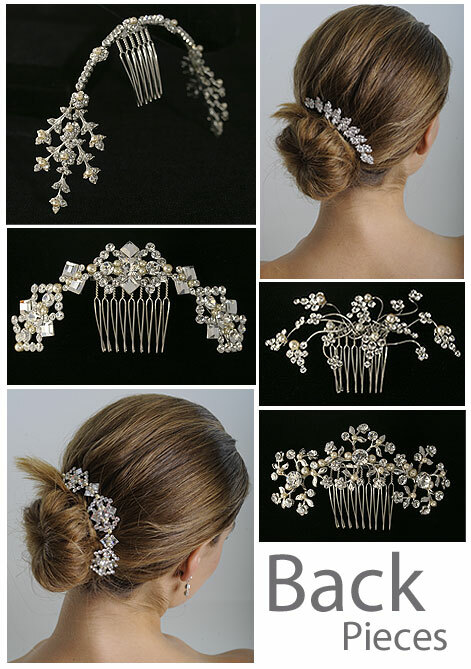 The Grape Flora Hair Ornament is made so that is also works well in front, perhaps on the side. Others such as the Jackie Back Piece and the Syvie Back Piece are very rounded and more suited for the shape of a chignon. In general there aren’t many “rules” about where a particular piece goes. For instance the Jackie Back Piece is very dramatic and beautiful placed in front and off to the side. It’s all up to your imagination & hair style! I’ve been completely amazed and slightly amused to see the combination’s and placements of headpieces over the years. Do you have a question about how to wear a piece? Do you have a picture of yourself wearing a piece that you would like to share (please I love receiving pictures of our brides :-)? Email me- I’d love to hear from you!